The UEFA Cup Winners' Cup (also referred to as the European Cup Winners' Cup), the tournament between the domestic cup winners, existed from 1960 to 1999. The structure was a knock-out tournament in which the matches were decided by two-legged ties except the final that was played as one game on neutral ground (the final was actually decided by two matches once, in the first 1960-1961 edition). After the UEFA Champions League was established in successful terms and started to include more teams, the status of the Cup Winners' Cup was steadily declining. Therefore, the decision was taken to bring the Cup to an end after the 1998-1999 season and instead merge it with the UEFA Cup in the sense that domestic Cup winners would be included in that tournament. All the winners and runners-up trough the years of the UEFA Cup Winner's Cup. 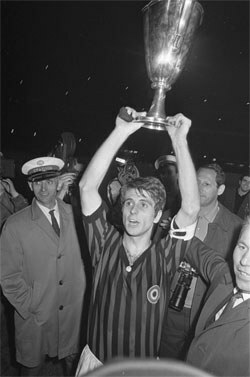 The establishment of the Cup Winner's Cup was a result of the growing interest among fans and the success of European Cup that started in 1955. The tournament was originally organized by the Mitropa Cup committee until UEFA took over in 1963. At the time the first tournament was held in the 1960-1961 season it included only ten teams. The interest among the clubs was at this time not very big, but the competition would, however, start growing both in regards of teams and prestige. By the late 1960s all UEFA members were represented by a team. AC Milan, the 1968 winners. In the 1990s, the Cup Winners' Cup would lose more and more status due to the increasing popularity of the Champions League. As Champions League expanded several times by including more teams from the European leagues, the teams qualified for the Cup Winners' Cup was no longer among the top clubs. Because of the decreased status, UEFA decided to end the competition after the 1998-1999 tournament. Lazio would become the last cup champions. The club that won the tournament the most times were FC Barcelona with four trophies (1979, 1982, 1989, 1997). Besides that Barcelona were also runners-up twice (1969, 1991). Beside the listings, 27 other clubs have won the Cup once. It should also be noted that English clubs was not allowed to participate in UEFA tournaments during between 1985-1986 and 1990-1991 seasons. Despite that, English teams performed best in the tournament if titles is counted, eight in total. Rob Rensenbrink is the player that scored the most goals overall in the Cup, 25 in 36 appearances with two teams (Club Brugge and Anderlecht). Other famous players among the top goalscorers in Cup Winner's Cup are Gerd Müller (20 goals), Gianluca Vialli (20 goals), Kurt Hamrin (16 goals), Hristo Stoichkov (15 goals).The club that won the tournament the most times were FC Barcelona with four trophies (1979, 1982, 1989, 1997). Besides that Barcelona were also runners-up twice (1969, 1991). * Levski Sofia was playing under different name during this period: Sport Club Levski (1914-1969), Levski-Spartak (1969–1985), Vitosha Sofia (1985–1989). The most participating team, Cardiff City, is from Wales and did qualify by winning the Welsh Cup (they reached the second round as best). Less known nationalities of the clubs in the list are Cyprus (APOEL) Malta (Floriana). 1968 The competition was for the first time represented with teams from all UEFA members. 1978 Anderlecht become the first club to win the tournament twice (1976 and 1978). 1972 Rangers become the first club to reach the final trice (1961, 1967 and 1972). 1999 The competition is abolished and merged into UEFA Cup.